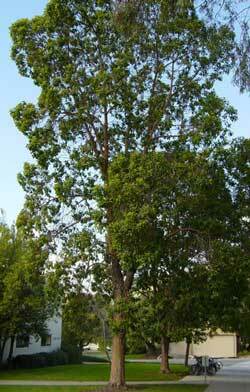 Please note this tree is in the same family as the Eucalyptus. The Brisbane box grows fast and tall and SHOULD NOT BE PLANTED UNDER POWER LINES. That said, it grows as easily in poor soil, wind and coastal conditions. 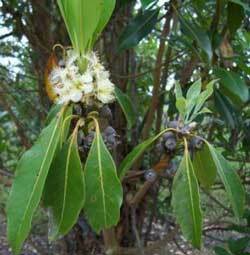 This tree looks similar to a Eucalyptus with gray green leaves, peeling brown gray bark, small whitish yellow flowers followed by interesting brown seed capsules that do not drop from the tree. It takes full sun, very little water and is resistant to many pests and diseases. This tree is appearing on many suggested California street tree lists but currently there is no local info on how Brisbane Box grows in Marina. The taxonomy has changed recently on this tree with new dna info and is now known as Lophostemon confertus in some nurseries. *note asterisk denote species will be shaped by a prevailing wind. This tree does not like prevailing winds..
**note asterisk denote species grows fast and tall and should never be near power lines. ***note asterisk denote species may need trimming to keep fast growing height under control. Choose location carefully.